In this post I'm going to show how to implement a policy to forward some specific service through a secondary ISP. A dual-ISP scenario was described in my post about redundancy. I have ran two traffic simulations to demonstrate how the firewall would handle HTTP and SMTP traffic for the same source and destination. Obrigado por compartilhar seu conhecimento com todos! Do you know of a way to accept VPN client connections from the secondary ISP while using tracking, and tracking is using the primary ISP? You just have to enable isakmp and assign a crypto map to the secondary outside interface. Then you set the VPN client to connect to the secondary ISP IP address. In other words, you have to do everything you'd do on a single ISP scenario but using the secondary outside interface. I have done this but I can only ping the outside IP that the tracking is marking as primary. The VPN on the second IP times out unless I check the route metric to be less than the primary. Then I can ping and connect the VPN. 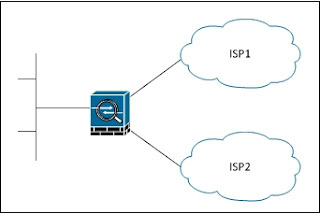 Did you add a static route to the IP pool through the secondary outside interface? I have a route for my back up ISP. I am using this pool for both tunnel groups. I can see this being a problem for return traffic. I don’t see how this would stop me pinging the backup outside IP or connection the VPN. I see a lot of posts on line that the ASA only support one ISP active at a time. Do you know if this is correct? I will lab this scenario and let you know the results.